Multi tool systems are ideal if you don’t have space to store a lot of gardening machinery, or don’t want to buy multiple pieces of highly specialised equipment. Sourced from top-quality manufacturers like Mitox and Cobra, these powerful and efficient all-in-one machines can be relied upon to perform a host of essential tasks, and have a huge variety of optional attachments. We’ve chosen all of the products in this range because they represent the cutting-edge in multi-tool technology. They all posses the power that’s needed to blaze through jobs like strimming grass or hedge cutting, and can be configured to tackle many jobs - irrespective of whether you're trying to maintain your own garden or are contracted to use equipment on a daily basis. Central to any multi tool is the power unit, onto which can be fitted a choice of attachments designed for cutting, trimming, pruning, blowing and cultivating. All of the multi tools we sell also make use of an ‘easy-switch’ system of some kind; designed to ensure that you can swap attachments with minimal faff and hassle. Increasingly popular are the innovative cordless multi tools from EGO Power+ and AL-KO. If you’re looking to tackle a range of gardening tasks at a fraction of the costs incurred by buying the dedicated tools individually, there will be something here to suit you. Select one of the options below for more information or, if you have any questions about our multi tools, call us on 0800 014 8700 for help and advice. Innovative, environmentally-friendly and clean - the new EnergyFlex 36V cordless garden multi-tool system from AL-KO includes strimmer, brush cutter, pole pruner and hedge trimmer. Offering outstanding value for money, Cobra multi tools are perfect for those that want to dive in, and tackle a variety of jobs on a budget. Top class two-stroke technology from a leading Italian manufacturer, any passionate gardener would love to own an Efco multi tool. The budget 4-in-1 Gardencare multi-tool range makes short work of unruly gardens, and includes attachments to prune branches and clear brambles. Hitachi Smart-Fit attachments extend the capabilities of the loop handle brush cutter range and are simple to detach and transport. Flexibility and value for money from Lawnflite Pro; one powerful 26cc powerhead with brush cutter and hedge trimmer attachments for the professional user. From pole saws and cultivators to shaft options for line trimming, Makita 4-stroke multi tools can deal with almost any gardening task. McCulloch multi tools are a reliable option, offering blowers, edgers and much more for gardeners who demand a lot from their equipment. Our best-selling brand, Mitox boasts three levels of garden multi tool, so the right tool for the task in hand is always available. Quality 26cc 4-in-1 multi cutter with hedge trimmer, strimmer, pruner and brush cutter attachments, plus extension bar from The Handy. Trim, cut and prune with a cost-effective Tondu multi tool, providing a simple solution for domestic garden maintenance. 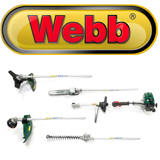 Enjoy the ultimate in gardening convenience with this four-in-one petrol multi tool from iconic British brand Webb.